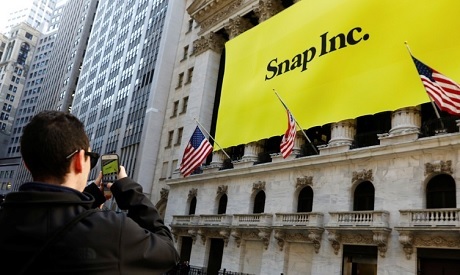 Snap Inc has pinned its hopes on the over-35 crowd to revive user growth for its photo messaging app, a shift ad buyers said could backfire. Wooing older people to Snapchat, known for disappearing messages and cartoon selfie photo filters, could alienate its cult following of youngsters, ad buyers and other executives warned. Companies hoping to target young users may in turn move their ad dollars elsewhere, denting money-losing Snap's primary revenue source. Look no further than Facebook Inc , warns Jenny Lang, senior vice president of integrated investment at full-service ad agency UM Worldwide, which counts Coca-Cola and Sony as clients. The social media platform has lost younger users in recent years while gaining older fans. "I hope they don't change too many things around; that's a fear in your head," Lang said about Snap, adding that younger audiences are harder to reach for advertisers as more apps compete for their time. In August, research firm eMarketer estimated Facebook will lose 2.2 million users between 12 and 17 by 2022, though Facebook's 1.49 billion daily active users dwarfs Snapchat's 186 million. Pressure has mounted on seven-year-old Snap. Two straight quarters of user losses sent shares down by two-thirds from a February high. Snap declined to comment on its growth plans and relationships with advertisers. Evan Spiegel, Snap's 28-year-old chief executive, first discussed broadening Snapchat's appeal in late 2017, and called adding users older than 34 a "marketing and communications challenge" on an October earnings call. A redesign rolled out by February 2018, which made it harder to re-watch friends' stories and separated those stories from publisher content, drew condemnation from Snap's base. Snap has still managed to boost revenue with an easy to use self-serve ad platform. It is also hoping to gain more younger users outside the United States by fixing its glitchy Android app. But several in the ad industry said it now risks losing millennials to upstarts like short-form video app TikTok, which does not have paid ad spots, or rivals like Facebook's Instagram. There are signs Snap is luring some older users. The website for AARP, a senior citizen advocacy group, reported in February some were turning to Snapchat to flirt and hide affairs. Even so, gaining wide adoption could be hard given Snap's youth appeal, critics of the strategy said. Fifteen percent of Snap users were over 35 at the time of its initial public offering in 2017. Parents could be convinced to use Snapchat because it is their kids' preferred messaging app, and more intuitive navigation could help, said one person familiar with Snap's plans. Another area needing improvement is the content side of the app, the person said. Snapchat's original design reflected a keen understanding of younger users, ad executives said. For instance, parents cannot easily embarrass their children by tagging them in photos. "Snap has a special place where teens felt more comfortable, and that has helped them grow in the U.S," said Richard Guest, global digital officer at creative ad agency DDB Worldwide, who developed Snapchat ads for various Mars Inc brands. Snap needs to tread carefully, said Issa Sawabini, partner at Fuse Marketing, which has created Snapchat ads for Amazon and Starbucks. "Maybe you don't want to be on the same platform as your parents," he said. Teens were loyal to Snapchat as Instagram introduced copycat features over the past two years, noted digital and social media strategist Jackie Hernandez at full-service ad agency The Community, who counts Verizon and YouTube as clients. Snap should focus on its "bread and butter" demographic, she said. Snap has spent to distinguish itself from rivals with Discover, featuring original scripted shows and content from publishers like The Washington Post alongside "influencers" - people with large social media followings. Advertisers targeting an older audience may be uncomfortable placing brands next to that content if it is all housed in one place. Snap has struggled to translate user data into suggested content, and is considering separate Discover versions for kids and adults, the person familiar with Snap's plans said. Richard Greenfield, media analyst at BTIG Research, has slammed Discover's layout in research notes, noting more traditional sources appear alongside scantily clad influencers. Snapchat's Stories - videos or photos that disappear after viewing - attract teens and millennials used to constantly sharing with friends, but can turn off an older audience, said Ryan Pitylak, chief executive of ad agency Unique Influence, a subsidiary of advertising holding company MDC Partners, which has worked with mobile video game company Ludia on Snapchat. "If they change the functionality too much, that's when I think you'd have the problem of losing younger users," Pitylak said.